Greek Quinoa Salad: Packed with protein, fresh vegetables, olives and a delicious Greek Dressing, this light salad is satisfying and healthy. I adore Greek Food. I adore Quinoa. I adore quick meals. So it is only natural, I would throw these three elements together to create an easy Greek Quinoa Salad. Quinoa is a neutral grain, that while loaded with protein, it is not really singing with flavor. 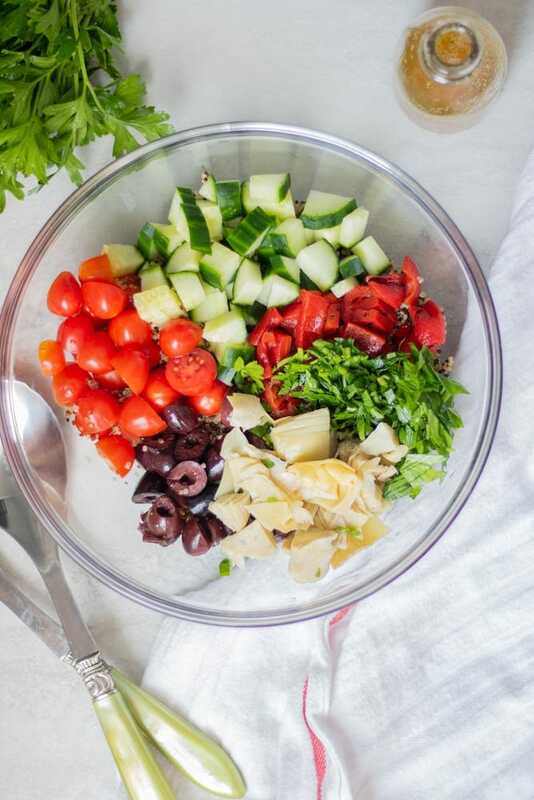 HOWEVER, this makes quinoa a great blank canvas for this Greek Salad, as it will soak up the Greek Dressing and not compete with the flavor profiles of the roasted red peppers, fresh vegetables, or briny olives featured in this salad. I prefer using Instant Pot Quinoa, as it is the fastest and most fool-proof method to cooking quinoa. However, if you don’t have an Instant Pot, simply cook your quinoa on the stove, according to package directions. 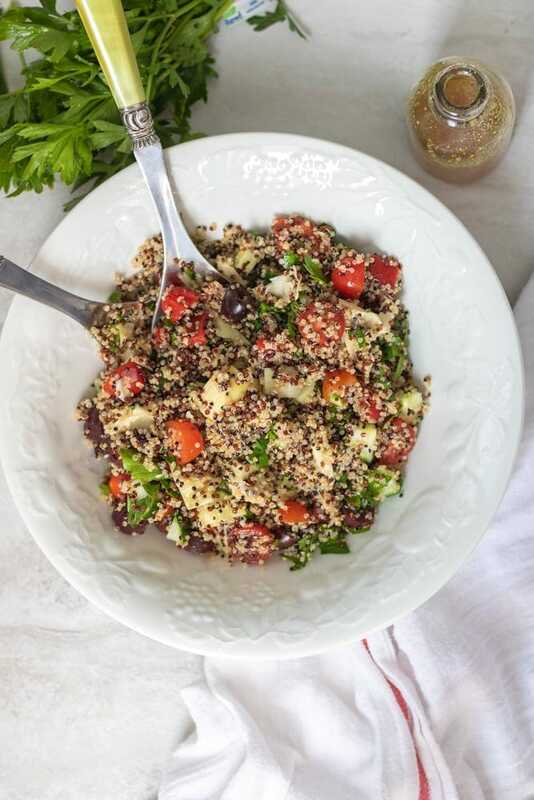 This Greek Vinaigrette is such an easy dressing to make and is perfect not only for this quinoa salad, but also to keep on hand to dress tossed salads. It is as simple as throwing the ingredients into the blender and blending. And yes, you can simply whisk the dressing together by hand, but I prefer to blend the dressing together to break down the capers so that they don’t overwhelm the salad if whole. Feta–if I am not looking to keep this salad vegan/dairy-free, I add in 1/2 cup crumbled feta. Once the quinoa is done cooking, cool slightly. Pour half the dressing over the quinoa and then allow to cool completely. Add in the prepared ingredients, along with the rest of the dressing and toss together. Serve immediately or refrigerate for up to 4-5 days. This is a great recipe to use for meal prep. Make early in the week and use for lunches as the week goes by. Grilled Greek Chicken pairs perfectly with this quinoa salad for a hearty meal full or protein. If you choose to use a regular (kirby) cucumber over an English cucumber, be sure to peel your cucumber and de-seed it before adding to salad. If you use vine-ripened or roma tomatoes, de-seed before adding the salad as well. Packed with protein and classic Greek flavors, this simple Quinoa Salad makes a perfect lunch or light dinner. Cook the quinoa, according to the package instructions. It is usually about 20 minutes of simmering, after it comes to a boil. Allow quinoa to cool. In the meantime, prepare the dressing by blending the red wine vinegar, olive oil, oregano, garlic, capers, salt and pepper. Once quinoa is cooled slightly (about 10 minutes), pour half the dressing over the cooked quinoa. Once quinoa has reached room temperature, pour remaining salad dressing over quinoa and add in remaining ingredients. Toss together. Serve immediately, over after refrigerating for several hours. It deepens in flavors the longer it sits. This recipe is right up my alley! Anything with quinoa and veggies I love. This recipes sounds like it has great flavor. Can’t wait to give it a try! Thanks Shannon. I love quinoa as well!! I hope you enjoy this recipe!!! Nutrition facts does not list what s serving is. Could you tell me what that is? Hi Dennis, one seeing is about 2/3 cup of prepared salad.